One of the nation’s oldest savings and loan associations selected The Seroka Group to help celebrate its 100th anniversary. 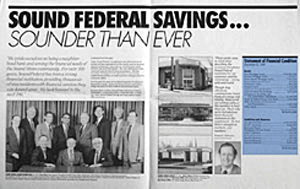 Sound Federal Savings and Loan, a Mamaroneck-based association, wanted to raise brand awareness of its centennial to increase assets under management, and profitability of the thrift institution. At the time, the association had about $150 million in assets under management and was looking to grow and increase shareholder value. The first step involved assessing the exact client requirements by evaluating all previous programs and determining the overall objectives, strategies and key messages before developing a plan. The thrift's heritage and strong financial standing became the key focal points of a year-long celebration throughout Westchester County. This was reassuring for investors who were besieged by a chorus of bad news from many other savings and loan associations. "The primary communications objective of the program was to communicate to customers and all area residents that Sound Federal is doing exactly what a good S&L should be doing… running a profitable business and investing in the local community," said Paul Seroka. "Sound Federal had an excellent story to tell, and we wanted the marketing communications program to be more than an anniversary celebration." The Seroka Group developed a brand awareness and business development plan encompassing a myriad of integrated marketing and promotional activities. Once approved by the association, the agency coordinated a customer, media and community relations effort to establish new business relationships in every market served by the association. Some of the completed activities for each market included: special events with community leaders in each branch, a professional written and designed historical insert for area newspapers, display advertisements throughout the year featuring customer testimonials, a direct mail campaign featuring new services directed at area residents and customers, a custom videotape, presentations to local civic groups and media interviews. One immeasurable objective was to establish new customer relationships throughout each community that year laying the foundation for future association growth that has occurred in the years since this campaign was completed. At the end of the campaign, Sound Federal increased assets under management by approximately 10% or $15 million. "We experienced significant growth in both assets and profitability. It was one of the most successful years our bank has had in quite awhile thanks to the part The Seroka Group played in it," wrote Paul Starck, Sound Federal's President and Chief Executive Officer in a letter after the campaign.